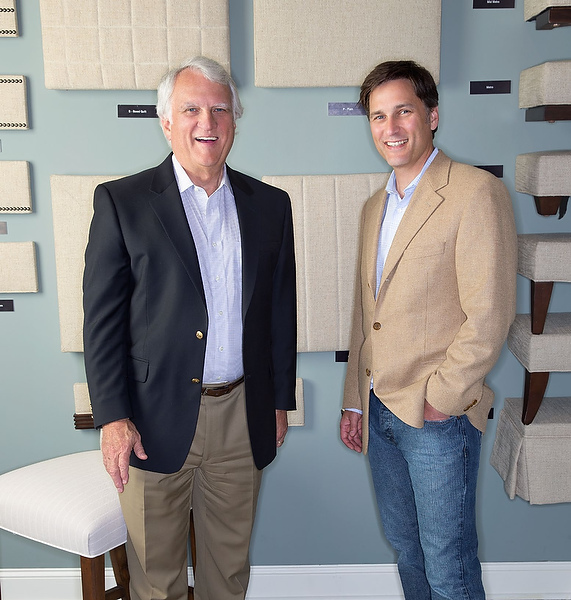 Eddie Deal (’88), CEO of Wesley Hall Furniture Inc., a high-end upholstered furniture line based in Hickory, North Carolina, and founded 25 years ago by his father, Ron Deal (’65, P ’88, ’91, ’94), pictured here on the left. How did you end up in the furniture business? Eddie: Being the fourth generation in my family to do so, I didn’t have much choice but to go into the furniture business! Actually my father, also a Wake Forest graduate, presented me with the opportunity to be involved in the startup of our upholstery company, Wesley Hall. Prior to that I had a very brief stint working for a large bank and knew that wasn’t for me. Did any courses or professors help your journey? Maybe not courses directly, because I don’t think majoring in history would be considered a typical way to receive training to run an upholstery company. However, the professor who had the largest impact on my personal development was Professor of Mathematics Marcellus Waddill, our fraternity’s chapter adviser. I had the opportunity to work with him on a number of things, and I’ve always been impressed, and more importantly, influenced, by people like him I consider to have strong character and great humility. What do you think are some of the most exciting aspects about working in furniture and design? Watching something go from development to actually sitting in someone’s home is a neat feeling. In my opinion, the biggest evolution I have seen in our industry involves the patterns of distribution. Styling comes and goes, but how we market and distribute our product has changed and will continue to change in the coming years. We have seen a decline — particularly in the last five or so years — of the traditional furniture retailer. We are increasingly selling to the design trade in some way, shape or form, be it directly or through a wholesale showroom. What’s your favorite furniture piece in your own house? It is actually a leather chair that’s in my youngest son’s room. It’s my favorite because it is unbelievably comfortable and we sell a lot of them. 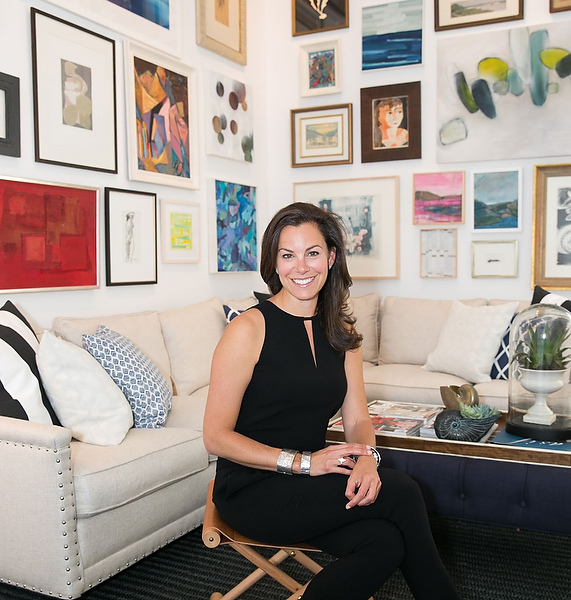 Serena Fisher Dugan (’94), co-founder and chief creative officer for Serena & Lily, a Sausalito, California, design company known for its line of furniture, bedding, wallpaper, rugs and other decorative items. The company’s first California store opened in May in San Francisco. I ended up there quite unintentionally. I was a psychology major, intending to continue on to grad school and become a practicing psychologist, but realized my calling was more creative. So I went back to school and soon became a decorative painter, moved to San Francisco and grew my decorative-painting business, which eventually evolved into textile design. In 2003 I met my now-business partner, Lily, and we decided to start a line of baby bedding. That led to bedding, fabrics and textiles for the whole home, then further evolved to include furniture. How did your time at Wake Forest influence your success? My psychology degree definitely plays a part in everything I do, and it really provides the underpinnings to design, interestingly enough. Understanding the customer psyche is the root of good design and sellable product. In looking back, my time and my experience at Wake Forest formed me — both socially and intellectually. What do you love about working in furniture and design? The most exciting thing about the furniture/design industry is that everything evolves, but nothing changes. There’s continuity in the function of furniture. As such, there’s a true furniture heritage to the United States. It is an American craft and will continue to be, because although you can produce everything for less overseas, you still have to ship it, and shipping a sofa is cost-prohibitive. So the furniture industry — particularly that in North Carolina — will continue to thrive. My favorite is our sofa — designed by us (Serena & Lily), and made by Lee Industries out of Hickory, North Carolina. It’s oversized, with down-filled cushions and white canvas slipcovers … the whole family can nestle in for a movie quite comfortably. 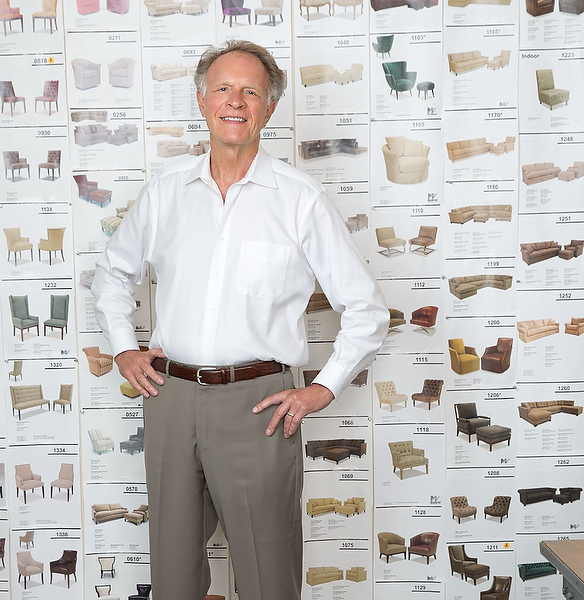 Bob McCreary (’61), of Newton, North Carolina, founder and CEO of McCreary Modern, a top manufacturer of upholstered furniture for such stores as Room & Board, Crate & Barrel and West Elm. How did you end up in the furniture business, and what is the future for McCreary Modern? I wanted to get into sales, and furniture seemed like a natural to me, having grown up near Lenoir, North Carolina, in the middle of the industry. Once in sales, I was fascinated with the design and marketing aspects of the business, which eventually led me to start my own company. I have no plans to retire, as I still have a passion and love for what I do, but it’s very comforting having my wife, Michele, as a partner in the business, and now my son, Robert, who joined the company in 2013 to carry on the business after me. The industry has certainly changed radically over the last few years and continues to do so, so it’s always our challenge to stay current and adapt to the changes. Wake Forest had a tremendous influence on my life. I wouldn’t have had the financial means to attend college without my football scholarship, so I am most thankful for having that opportunity. My years at Wake gave me a strong foundation, and the experiences and lasting friendships experienced during those years will be valued my entire life. Dr. Franklin Shirley and Professor James Walton in the speech department and Professor Marcel Delgado in Spanish were vital, giving me wonderful advice and purpose. Our athletic trainer, Doc Martin, was perhaps the most influential in keeping me on track and teaching me toughness and determination. What’s your personal favorite piece of furniture? My big chaise sectional that can accommodate Michele and me along with our two dogs. 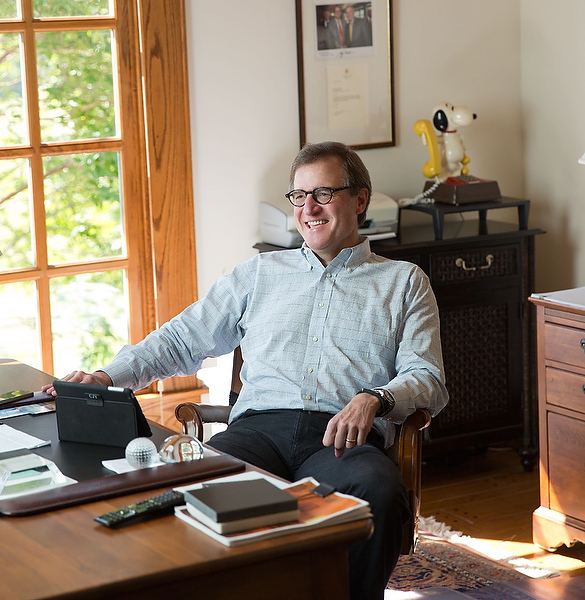 Jeff Young (’72), CEO of Schnadig International, a Greensboro, North Carolina-based manufacturer of case goods, lighting and upholstered pieces and with a showroom in High Point. What was your career path, and how did your time at Wake Forest influence your success? I was headed to law school, but my father said that the family furniture business was starting to show “appreciable growth” and he wanted me “all in” and now! Given all he had done for me up until that point, the choice was easy. I think the variety of courses I experienced at Wake was instrumental in my making the transition from college to a business that was just beginning to attract a national audience. Statistical analysis, math, public speaking and science … all of these disciplines helped me at different periods in my first five years in business. How will the home furnishings industry change in the next few years or decade? At present, our designs must play well to an international audience, as that has been our emphasis since we became a part of China’s second largest furniture manufacturer and largest furniture retailer in mainland China. In today’s slow-growth domestic economy, if you are unable to expand your base of revenues internationally, dynamic sales growth can be somewhat elusive. I still have a few original handmade samples from the collection that Bob Timberlake and I cobbled out together back in the roaring ’90s. These are coveted since they represent the initial vestiges of the industry’s first fully authored lifestyle furniture collection and the first to sell well more than $1 billion dollars at retail. The year these samples were made was also the year Lynn and I were married, so obviously they occupy a special place in our home and our hearts! Laura Walker Baird (’88), interior designer and owner of Verde Home, an Atlanta-based home furnishings showroom specializing in sustainable and custom products. 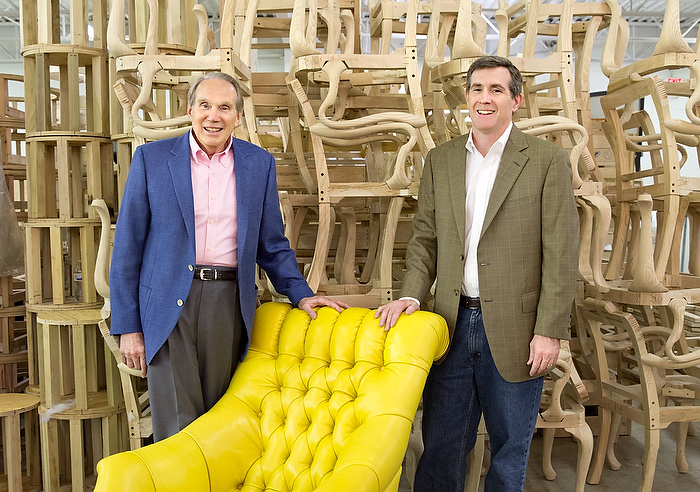 How did you end up in the furniture business, and how did Wake Forest influence your career? High Point was so close to the campus that I would go there when market was happening and was fascinated by the whole industry. Harry Titus in the art department was my biggest mentor. I went to Italy with him for a semester studying at Casa Artom, and this experience was probably the single event that opened my eyes to all things design, particularly the history behind design. What are some of the most exciting aspects of working in furniture and design? Many projects have special needs that you can’t find “off the shelf,” so we design a custom piece to fit the need, making the space unique to the homeowner. Working with local furniture makers and ironworkers to create exactly what we need has been a thrill. The most exciting thing for me so far has been the chance to design my own rug line called Imprints. It was inspired by my life in Italy, using traditional rug designs while playing with scale and color to create something fresh. I used to think this was a frivolous business but my mother told me that it’s not true. Making people’s homes a happy and beautiful place is important. What’s your favorite piece of furniture in your own house? My French armoire from Brittany. Although my style and tastes have evolved, I still love this piece for the history it brings to our home. I purchased it while living in London almost 20 years ago, and I remember that it was between this and a car. I am so glad I chose the armoire, partly because I still have it, and also because I was forced to walk everywhere, giving me time to really experience the city. John Bray (’64, P ’91), CEO of Vanguard Furniture, a Hickory, North Carolina-based upholstery and case goods company with products sold nationwide. He is pictured here with son Andy Bray (’91), Vanguard’s president. Why did you choose the furniture business as a profession? John: I had come back from Vietnam and was looking for a career, so I went to work with Ron Deal (’65, P ’88, ’91, ’94), one of my fraternity brothers. Then around 1970, a group of people were starting Vanguard Furniture; I joined it and have been there since. What appeals to you about the furniture business? It’s the ultimate entrepreneur’s job. If you don’t like what you’re doing, come back tomorrow because it’ll be different. What was your greatest influence at Wake Forest? I majored in business, so all the classes were relevant, but I particularly remember Professor Delmer P. Hylton’s accounting class and Professor Ralph C. Heath’s marketing class. What’s in your house that’s a favorite piece of furniture? In my living room, I have a sofa designed by Louis Nichole in 1980 and made by Vanguard. We had Louis design a line of furniture that we manufactured and marketed. He’s still designing, mostly in textiles, but he had decorated the White House for Christmas during the Carter administration — so we were capturing some of that notoriety for PR purposes. The sofa is a natural beige silk with convex lines, and those flowing lines were a little ahead of their time. Lisa Kline Mowry (’82) has been covering the interior design world for 24 years as a writer and editor with such publications as Better Homes & Gardens, Traditional Home, Kitchen & Bath Ideas, Metropolitan Home, Atlanta Homes & Lifestyles and Atlanta magazine.